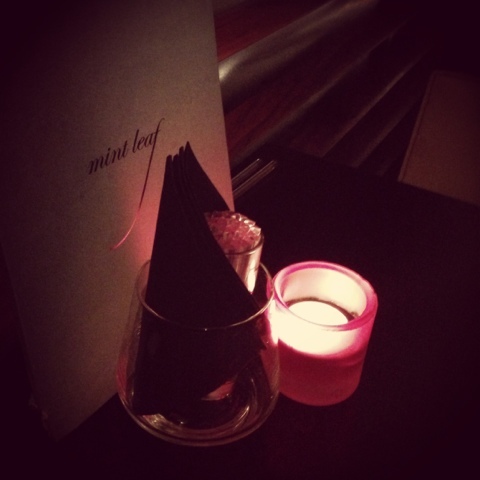 If you're looking for somewhere to relax at the end of the week in the city and not feel as though you have been caught up in a cattle ranch then Mint Leaf Lounge is awaiting your arrival. 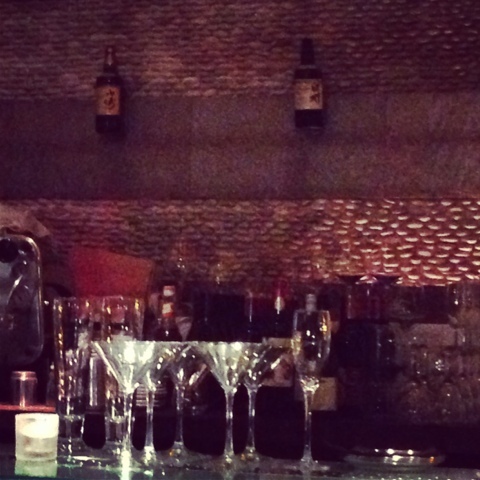 Even before you enter, the fairy lights provide a warm welcome and once inside, the hostess will lead you to your table and keep the drinks flowing in this ethnically dipped lounge bar. 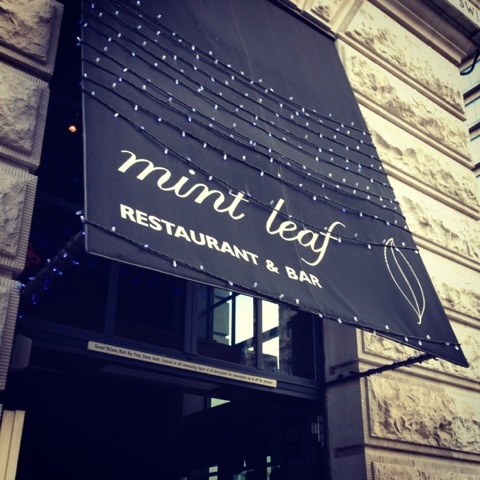 For those of you who try to avoid the city wherever possible there is also a Mint Leaf in Haymarket. While it is just a stones throw away from Trafalgar Square, as you descend the stairs you journey into a totally different world and couldn't feel further away from the swarms of tourists you have just navigated your way through. 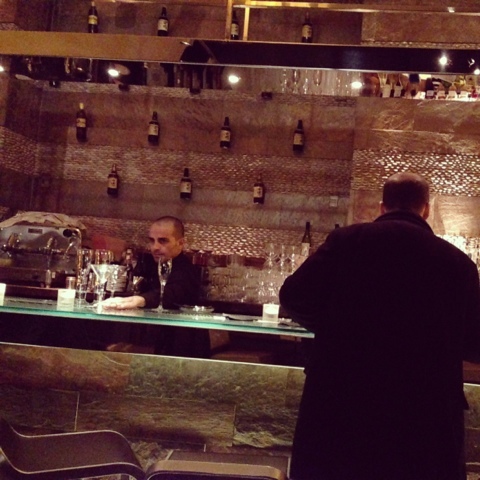 Back in Bank, we sat on a table overlooking the bar and I couldn't help but be drawn in by the rows upon rows of pebbles that provided the backdrop to the (apparently) floating bottles infront of it. Everything glittered and shone and I felt a little as though I had just entered a less OTT version of Aladin's cave! (Man in black coat was determined to be in the shot). The menu glowed behind the light of the (oh-so-romantic) candle and just had to be opened; welcome to wonderland Alice! 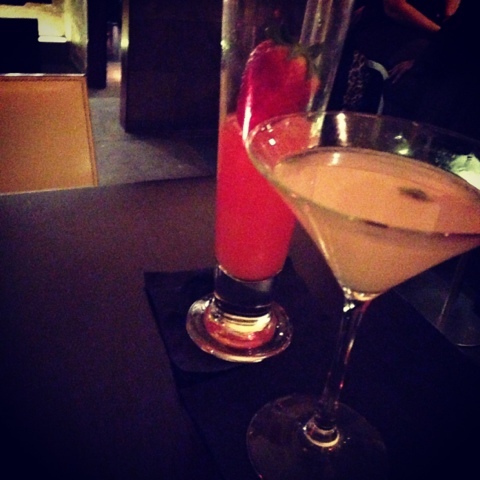 Elderflower Martinis and Strawberry Mules were our first liquid delight, each with their own exotic twist. We decided that the cardamon pod could remain in the 'garnish' category and so not feel too guilty about being left behind! My latest (mini) obsession with cucumber cocktails was also satisfied when it was presented to the table all citrusy and fresh. I strongly recommend it if you get the chance because (dare I say it), Pimms now has some serious competition out there! Just another quick shot of the pebbly wall .. 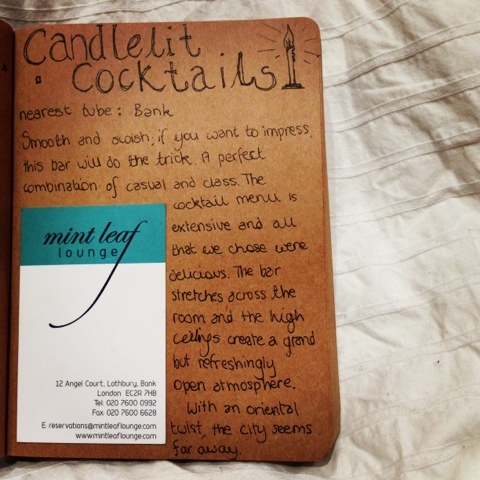 I think it is an idea that may just have to be borrowed for my future restaurant/ bar (watch this space)! It was ten to ten (cowboy time? Anyone)? and it was essential that we left some cocktails on the menu to try next time, so we bid goodbye to our little taste of the east and went to have Steak (obviously) just across the road at Le Relais de Venise (more on this later)!